Product #21608 | SKU 1000 385.0 | 0.0 (no ratings yet) Thanks for your rating! 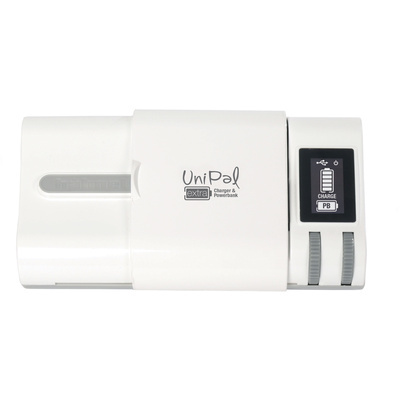 The UniPal Extra is a stylish universal charger with a built-in Power Bank. Compact, lightweight and easy on the eye, this portable charger is a one-stop charging solution for over 300 different lithium ion and AA Ni-MH rechargeable batteries. It will also charge your USB devices. The unit is supplied with a USB to micro-USB cable and can be charged from the mains, from a USB port on your laptop / PC or by using an in-car USB charger. It can also be used as a stand-alone charger using the built-in Power bank. Extra power on the move. All in one charger & Power Bank. No need for additional power supply. Simply connect to any USB power source. Charges over 300 different 3.6/3.7 V and 7.2/7.4V battery packs. Charges AA Ni-MH rechargeable batteries. 1A USB port charges mobile phones, tablets and more. Fine adjustment wheels to easily adjust the charger contacts. LCD display shows battery charge status whilst charging.